Small but fierce, these studs make a big statement! Crafted in the tradition of Dia de los Muertos Sugar Skulls, these shiny beauts stand for more than just fashion. 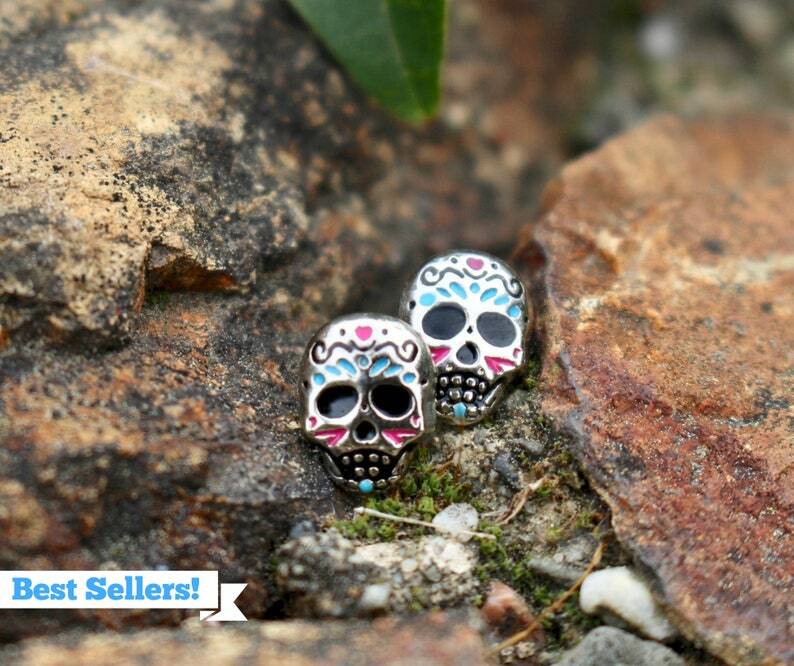 These cuties are 8mm and made of alloy metal! They are mounted on pure titanium posts, the pad is surgical stainless steel and the ear nut is plastic, so everything is hypo allergenic! We are passionate about hypo allergenic because our owner has ears just as sensitive as you! There is nothing worse than to find a CUTE pair of earrings that make your ears itch and burn! We hope these give you NO issues! This pair is super lightweight and very easy on the ears. They are also durable, double checked for strength and made with extra love! They are sure to get your lobes noticed! Try them on today and let us know what you think! Leave a review, share a pic and tag us on social media! Great earings. I ordered as a gift and they arrived in time for the birthday party, yay. The color does not show up as much as it does in the picture but still very satisfied. Earrings are beautiful !! Wonderful company and great quality. Thank you !